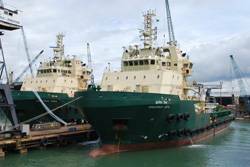 Anchor Handling Tug Supply Vessels Greatship Vidya and Greatship Vimla. Drydocks World delivers twin compact high power Anchor Handling Tug Supply Vessels to Greatship Group. Drydocks World, a service provider in the maritime, oil and gas industries, announced that it successfully delivered two sister Anchor Handling Tug Supply Vessels Greatship Vidya and Greatship Vimla, from its Singapore yard recently. They are among two ‘V’ Class series vessels for the Greatship Group. “Our services to the offshore, oil and gas industries have gathered momentum in recent months, following the re-alignment of our business strategy. We have been providing wide ranging services to the offshore industry and we have expanded our capabilities to address growing market demand. We are delighted to have simultaneously achieved productivity goals, along with organisational re-structuring and adjustment,” said, Khamis Juma Buamim, Chairman of Drydocks World. Greatships Vidya and Vimla are 9000kW, 150T Bollard Pull, DP2 vessels. The vessels are of dimension LOA 78.2m, breadth is 18.2m and depth 8m. The vessels are designed for optimum availability of space and meticulous layout of equipment resulting in a compact vessel providing outstanding output. These vessels are propelled by Wartsila’s gear boxes and propellers and the Main Engine for propulsion being Wartsila 9L32. The Caterpillar auxiliary engines generate a total of 1300kW per vessel, in addition to the power generated by two shaft generators providing an extra 4400kW per vessel. The towing and anchoring equipment is supplied by Fukushima(Japan) and the DP system is equipped and commissioned by Converteam(UK). AHTS Vidya and Vimla had undergone sea trials successfully and they are dual Classed under IRS and ABS.